story by Missy SteinbergEven in december, “Nature” Jack Marine’s Bala Cynwyd home is surrounded by dozens of pumpkins. These former jack-o-lanterns, some of which are as large as 200 pounds, rest in Marine’s seven compost bins, undergoing a natural, three-month metamorphosis. Over time the pumpkins will become organic soil that Marine will use in his home garden to grow tomatoes, peppers, eggplant and yes, more pumpkins. 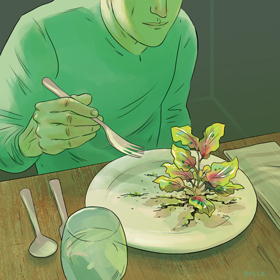 story by Alex ZorachI like to eat invasive plants. Sounds scary, right? Invasive species are plants or animals that have been introduced from other regions, accidentally or on purpose, and have negative impacts on local ecosystems. 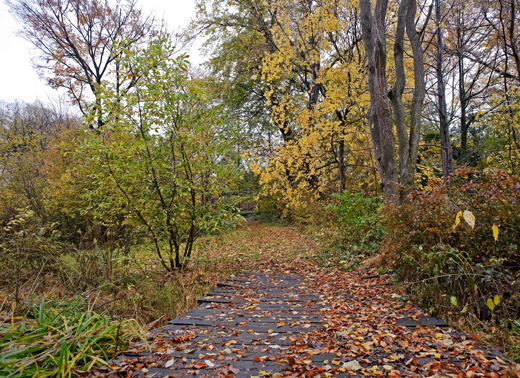 Whether or not you realize it, you have probably seen many invasive plants—they’re in gardens, vacant lots and even between cracks in the sidewalk. 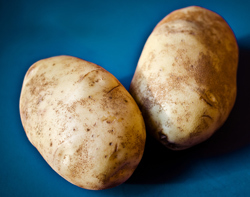 story and photos by Grace DickinsonThe Russet is our country’s favorite potato. Roasted, fried, boiled, baked, there’s really no cooking method that doesn’t yield a tasty result. In America, we find Russets as potato chips and French fries. They arrive mashed with milk and butter at our holiday tables, and foil-wrapped as a dinnertime classic finished with a generous dollop of sour cream. story by Courtney Sexton | photo by Albert YeeNeighborhood pride is alive and well in West Philadelphia thanks to VIX Emporium. Their “West Philly is the best Philly” logo, designed by local tattoo artist Justin Turkus, has developed a following, appearing on sweatshirts, t-shirts, notebooks and even aprons. The West Philly logo products are just one example of the unique, handmade items sold at VIX, which was opened five years ago by husband-wife team Sean and Emily Dorn. story by Courtney Sexton | photo by Albert YeeWhen Bill Green started Primex Garden Center in 1943, his business was predominantly a wholesale agricultural distributor, serving farmers in then-rural Glenside, Pa. Seventy years later, Green’s grandson, David, his wife Joan, and their son-in-law Danny are running a different kind of business at Primex, but one that’s proven to be as equally important to the community. story by Courtney Sexton | photo by Albert YeeWhen you think of local food, fruits, vegetables, dairy and meat probably come to mind first. But what about the family-run, small scale packaged food businesses that call Philadelphia home? 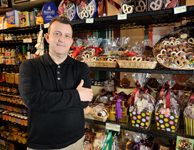 For 25 years, The Pennsylvania General Store at the Reading Terminal Market has been the one-stop shop for buying these regional treats. story by Liz PachecoSince 2004, the PECO Wind program has allowed customers to purchase renewable electricity that supported wind projects in Pennsylvania. But as of December 31, the PECO Wind program ended, leaving 20,000 customers without service. The good news for these 20,000 customers--as well as anyone interested in buying renewables--is that there are plenty of affordable options. Be careful though, not all alternative energy programs are created equal. Just because a utility company operates locally doesn't mean their electricity suppliers are local. It's not uncommon for wind and solar energy to come from outside the state, even the other side of the country. When the time came to purchase a dining room table, I fell in love with a piece made from stunning, richly grained mango wood. The table was an extravagant purchase, so I listened very carefully while the salesperson recited care instructions. Then I dutifully purchased the recommended furniture polish. As soon as the table was delivered, I lovingly polished it from top to bottom. However, the polish had a lingering smell. After the job was finished, I decided to read the ingredients. story by Bernard Brown | photos by Jen BrittonFor at least 10 years I’ve been trying to learn more about trees. Back when I lived in Atlanta, I resolved to identify the trees growing in a large wooded park near my home. I bought a Peterson field guide and got to work. I did okay with the big differences between, for example, the oaks and the ashes, the maples and the magnolias, but I had had little patience for the finer points. Was that an iron wood or a hornbeam? If it meant I had to count the scales on their itty-bitty buds, it was too much effort for a reptile and amphibian guy (herper) like me. story by Liz Pacheco | illustration by Melissa McFeetersWhen Mabel Wilson and her mother moved to Gray’s Ferry in 1929, her cul-de-sac block was lined with rowhomes. Soon though, many homes were abandoned and the City tore them down, leaving behind a block of empty lots. Looking at these new eyesores, Mabel decided to do something. “They began to use that lot for youth activities, vacation Bible school and community meetings,” explains Mabel’s son Stanley Wilson, pointing to a grassy lot across the street from Central Club headquarters, which was incorporated as a nonprofit in 1947. Under Mabel’s care, the empty lots became an unofficial community center. She offered classes in skills like typing and sewing, hosted picnics, and organized arts and crafts for neighborhood kids. She also planted gardens and taught how to grow vegetables, fruits and flowers, creating an edible urban oasis.